What was the biblical term for those living outside the city walls? Dr. Fleming: Remember that a gate can leave people out, or save people and protect them from within. Are you going to let poor people in when the enemy is coming? This becomes a big issue. You have walled mother cities and unwalled daughter villages. It's interesting the word kiryat in the Hebrew means "municipality" and is a feminine word. So, just like in English of Dallas you would say she. So, a mother walled city has unwalled daughter villages. Joshua destroyed these cities and their daughters, meaning men and women old and young dwelling in unwalled villages which are connected to a walled mother city. On the way to the cross when the daughters of Jerusalem are weeping, that doesn't mean women. It means they have gone outside of the city wall. The people living outside the wall are called daughters. Think of the wall as the skirt of the mother city. The outskirts then are the people who can't afford the taxes and things necessary to live inside the city. They are the poor. There are 200 references in the Bible where the word daughters is not next to a person's name. Daughter's of Jacob means "female offspring." Daughters of Israel, daughters of Judah, daughters of my people, daughters of Jerusalem — they all mean those who are landless, the poor, and the forgotten who are outside the protection of the walled mother city. The Word of the Lord in many places in the Bible comes to the daughters of my people. Don't forget the prophets. Don't forget the people. They are easy to forget since they are outside of the city. The prophets would remind the king not to forget those who are so easy to forget, and so the phrase "daughters of my people" is the way you say that. For example, on Palm Sunday, John uses that phrase when he says everyone is yelling "Hosanna." John quotes Isaiah, "Say to the daughters of Jerusalem your Redeemer is coming." That's referring to the people outside the wall, like on the Mount of Olives on Palm Sunday. Jesus had a special conversation with the daughters of Jerusalem who were weeping because they loved Jesus and hung on His every word. When they saw He was about to be crucified outside the wall, they were already there. Dr. Reagan: Yes, in fact Mary and Lazarus and Martha were from Bethany, which was a town of the poor. Dr. Fleming: Bethany would have been considered a daughter village, so therefore the "Daughters of Jerusalem." If Jesus meant the women who had come from Galilee with Him to Jerusalem, He would have said "Daughters of Galilee." But, no, He was talking to the people outside the wall of Jerusalem. Dr. Fleming: The municipality situation at the city gate has several important functions. There you would have a water reservoir as it's located at the lowest part of the town. As the water is draining, you try to have the water channel into a cistern. A cistern, unlike a well, is where you would store rainwater that flows into it. 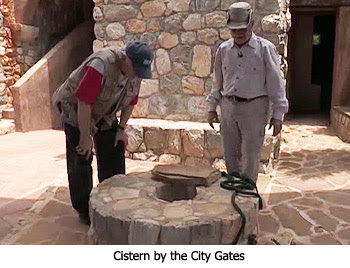 There is a grating at the entrance of the cistern, but it's not leading to ground water. 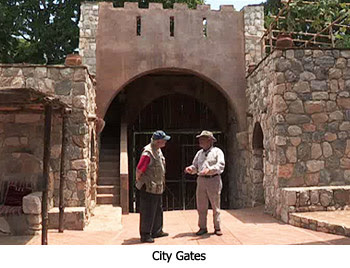 In fact, all gates are designed so that no water leaves the city if you can help it. Water falling on the top tower falls to a lower roof, and on this roof water drains from there down into the cistern. When the water cistern is full, it overflows to a cistern on the other side of the road. Hopefully then you will never have a rainfall with any water that actually leaves the city. You try to store water at all times. Dr. Reagan: Catching ever drop of water has always been an important task in Israel because of the fact that they have such a long dry season. Dr. Fleming: Yes, in Israel their last rain ends at the beginning of May, and then they don't get rain to return again until mid-September. That's a long stretch of five to six months, so when it's raining you've got to collect it. You also have to collect the rain during the winter rains and store it. Why is the water stored underground? Of course you need to store it underground because of algae. Darkness is the only purifier the ancients would have had. Algae can't grow without sunlight. So, they had to cover their cisterns. Having a cistern becomes very important to you if there's an enemy siege. 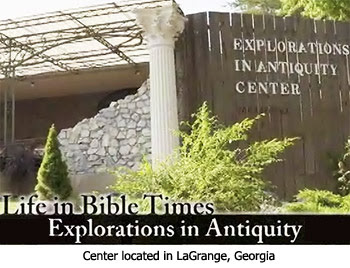 In the eighth part of this series with archaeologist Dr. James Fleming at his Explorations in Antiquity Center, we'll glean some biblical insights by learning what in Bible times life was like being able to eat during an enemy siege.